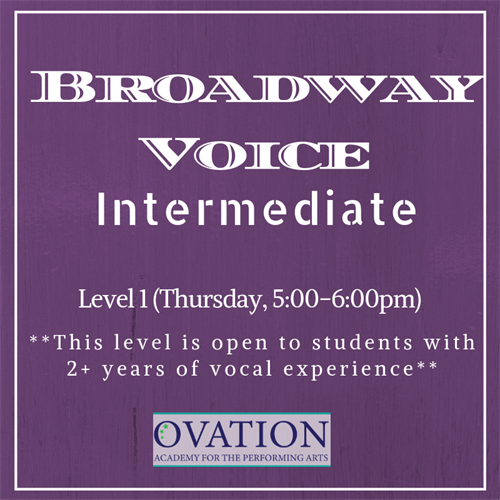 Intermediate Broadway Voice - Mar 28, 2019 - Oak Park-River Forest Chamber of Commerce, IL ? ?Belt? and harmonize your way to Broadway! Classes focus on Broadway style vocals, while reinforcing fundamental voice techniques. Students explore age-appropriate breathing and vocal techniques through a variety of vocal repertoire, while improving music theory, sight reading, and selling a song. Audition preparation and performance skills will be practiced through in-class performances, including the final class vocal showcase. Thursday, 4:45-5:45 pm starting 1/27 through 5/12. See website for additional information.